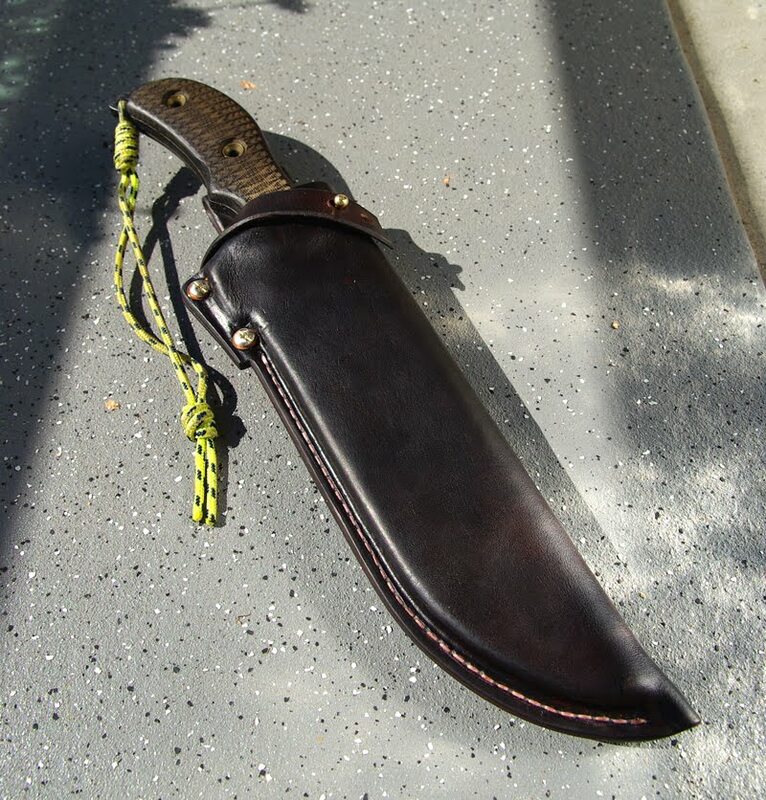 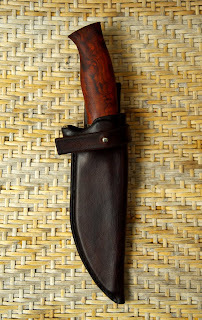 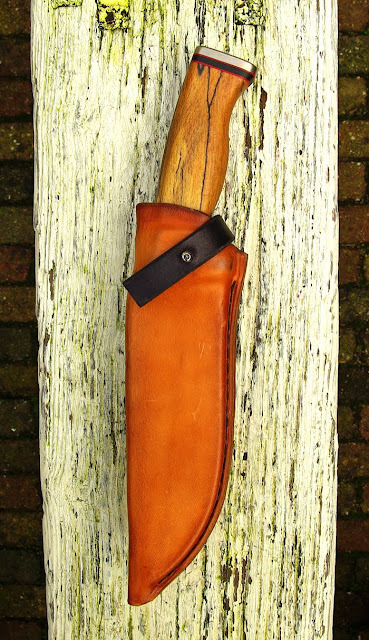 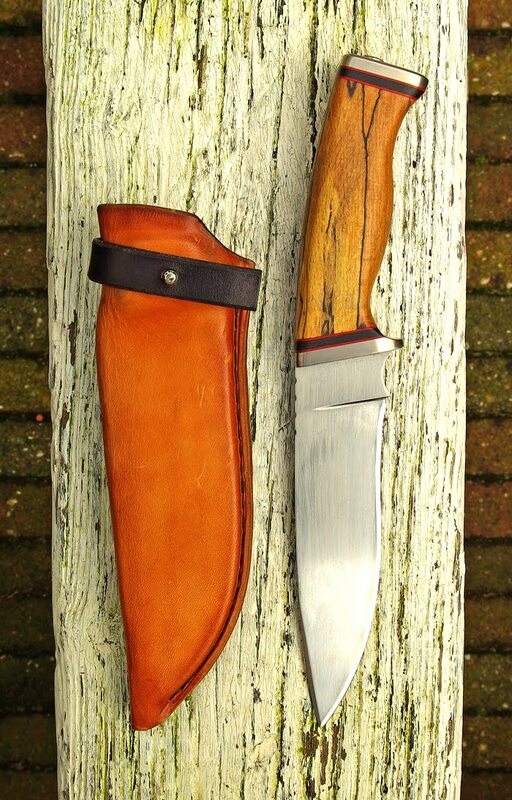 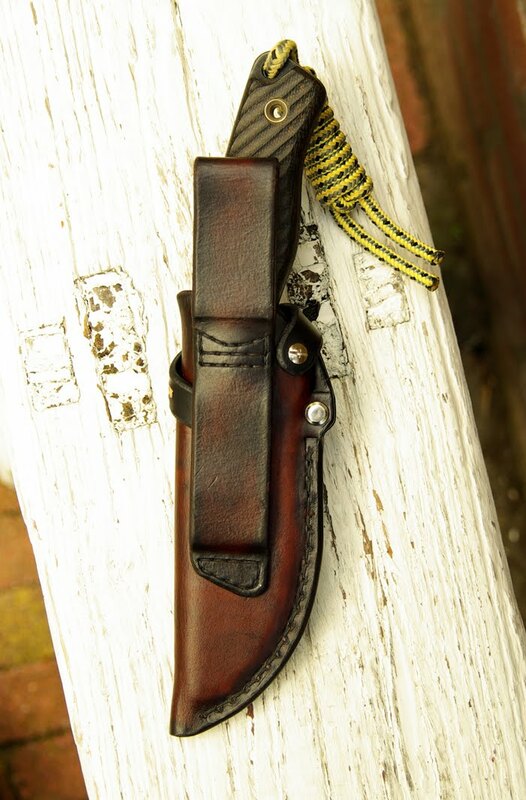 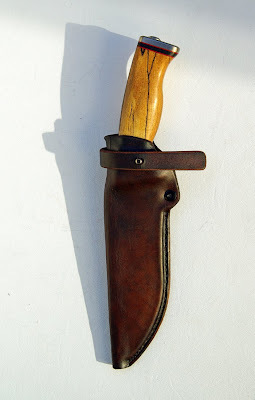 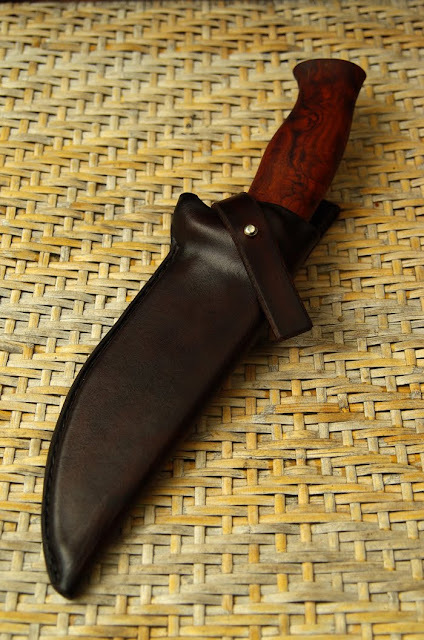 My mission was to make a sheath, that would be very stiff, secure, strong, very weather-resistant, comfortable to carry and use, and a bit pretty too. 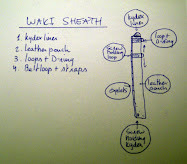 And here is prototype no 1 . 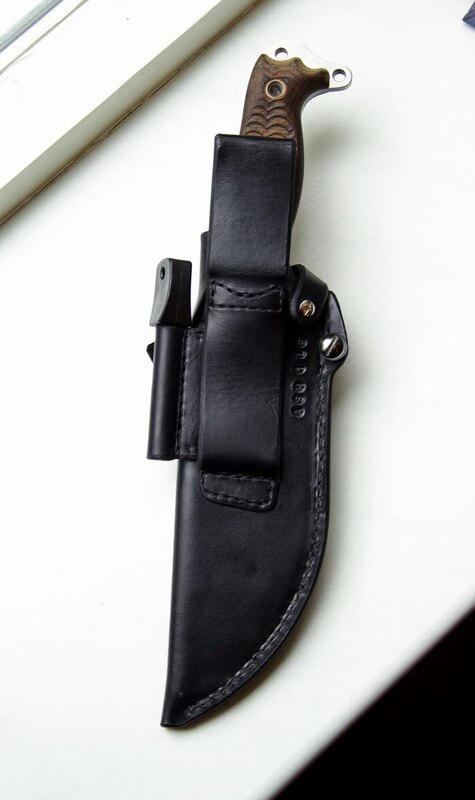 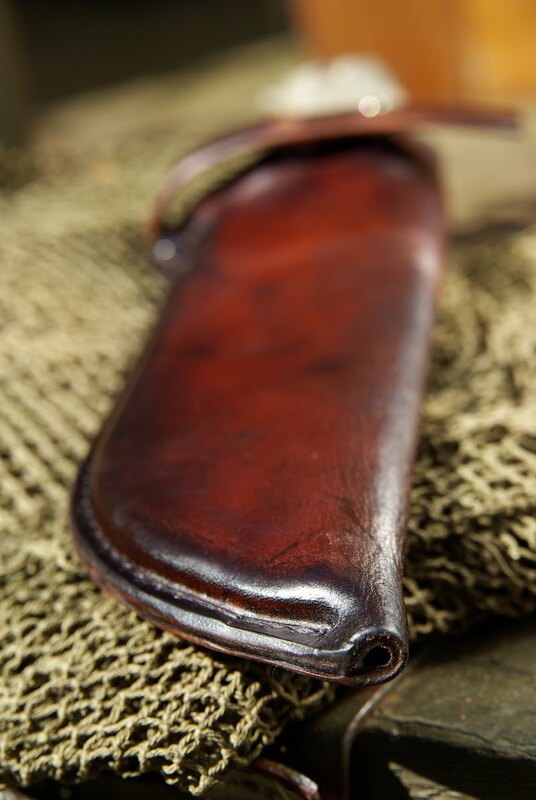 It’s basically a leather pouch-sheath made of 3mm (0.12”) half tanned leather, wetformed around a stiff and sturdy Kydex liner that has a thickness of 3.2mm (0.13”). 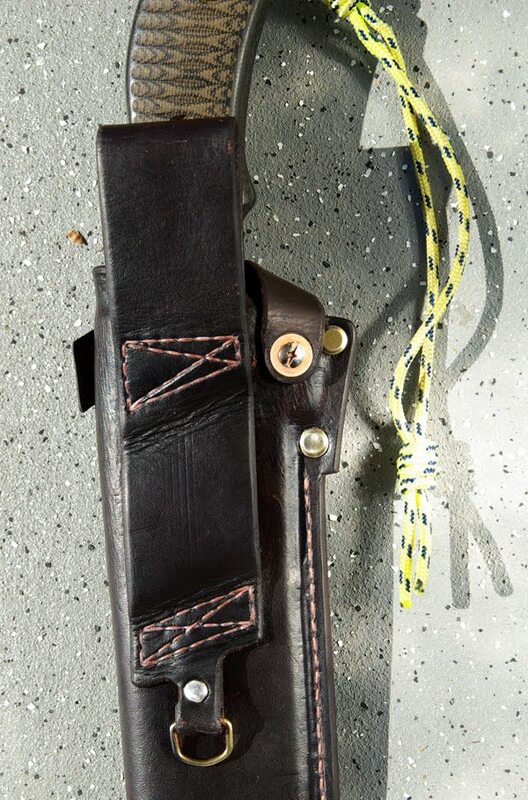 The pouch is glued, saddlestitched with waxed tigerthread, and screwed with stainless steel Chicago screws. All the stitches are nested in the leather, so there’s no thread sticking above the surface of the leather, protecting it from abrasion. 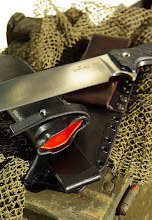 The Kydex provides a very secure place to store the knife. 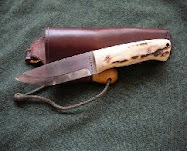 The top of the liner is formed round the base of the handle of the knife, and so form a cup, that make the tip of the blade slide into place easily. 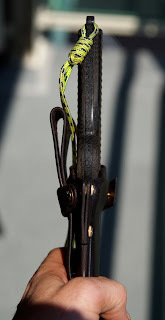 No worry you are poking up the leather, when visibility is poor, and control sub-optimal. 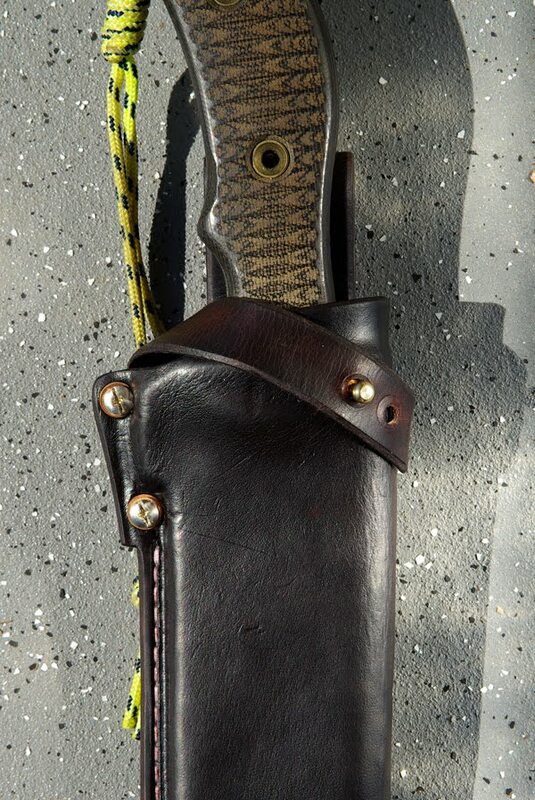 The last 1/3” the Kydex closes tightly around the guard of the blade, and locks it securely into place with a smooth ‘klack’. 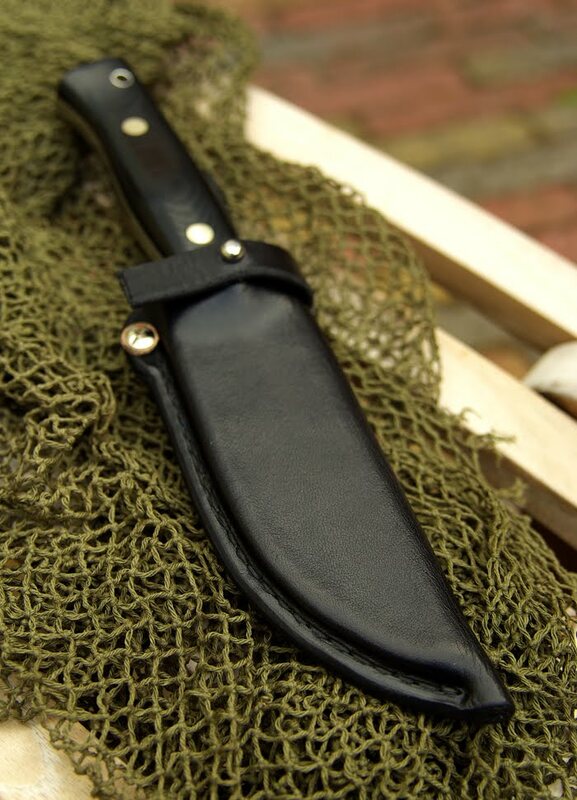 The liner provides the stiffnes and the detent for the blade, so it can be clicked into place thousands and thousands of times. 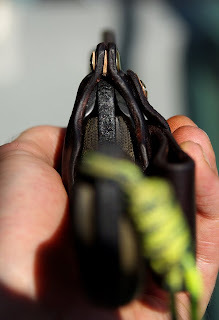 Bending the Kydex helps a lot since the bend in the spine will provide the key stiffness. 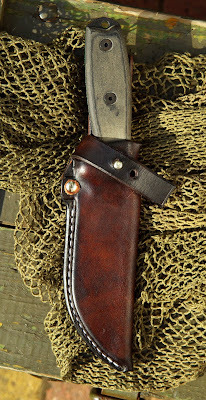 While in the sheath it is impossible for the blade to cut through the stitching as the leather is pressed against the kydex very firmly. 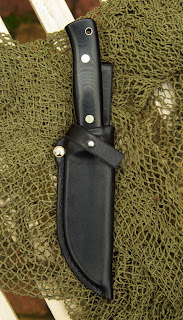 Blade geometrie (full flat, high convex edge) will prevent the edge from ever reaching the thread. 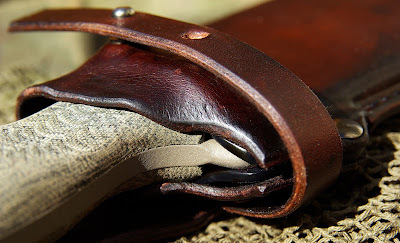 So no welt is needed. 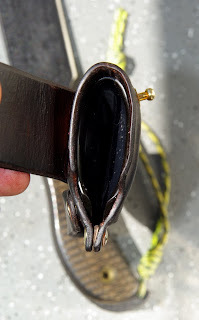 Besides that, the leather is molded over the split in the liner. In fact, no vulnerable sewing thread whatsoever is exposed to whatsoever steel anywhere inside the sheath. 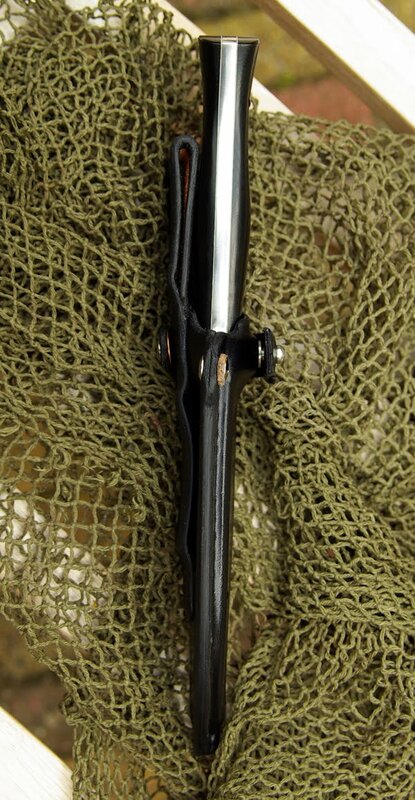 The Kydex liner CAN be removed, but it will be very hard to put it back into place. There’s a draining hole in the bottom of the sheath which will allow water and dirt to pass through, so it won’t be really nescesary. 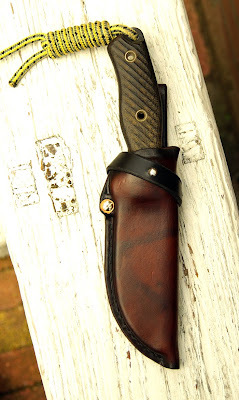 The Leather is supposed to cover the “pretty” part of the piece. But the leather is there not only to be pretty. 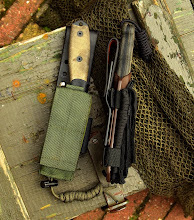 It feels pleasant in the hand and on the belt (much better then a stiff tek-lok), looks good, and acts as an soundbuffer, since sheaths made entirely of kydex, tend to be a bit noisy. 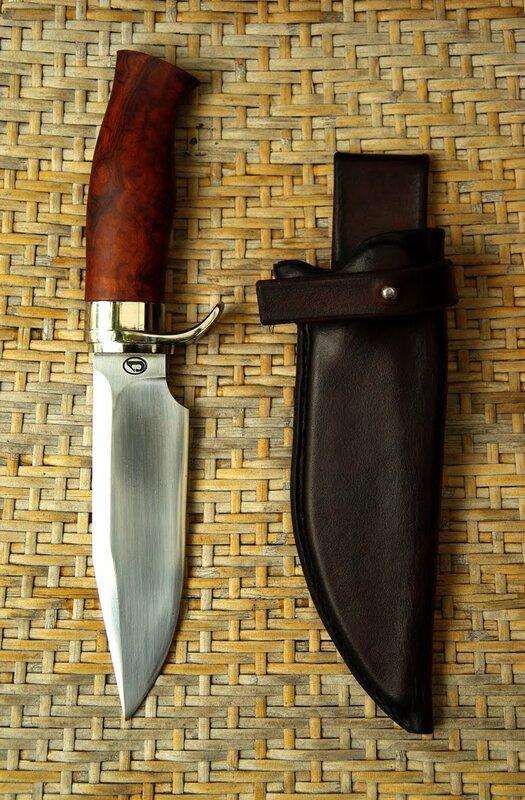 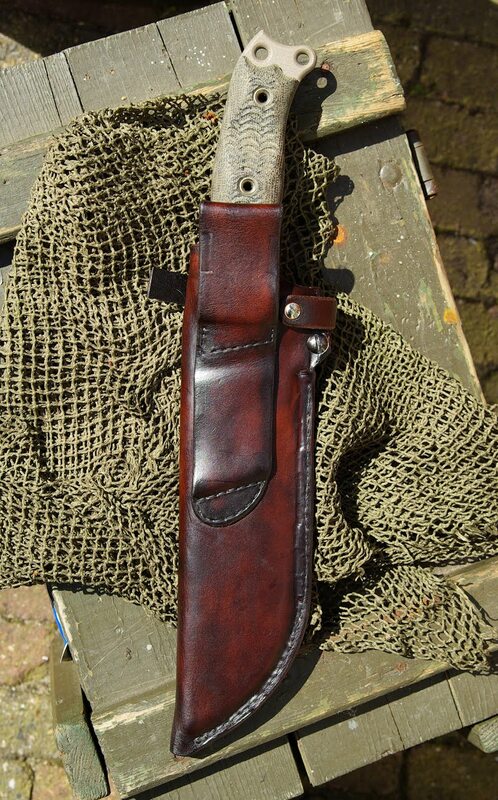 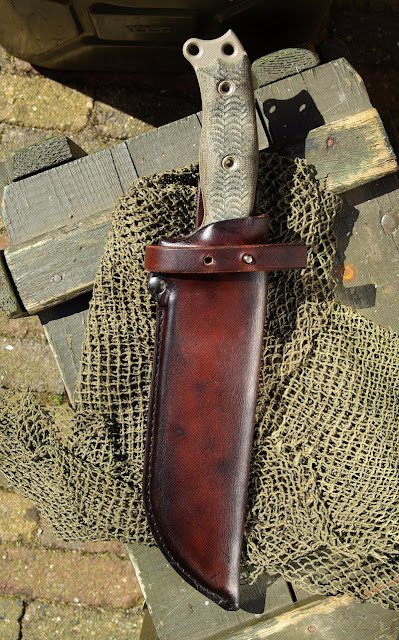 It’s dyed with Fiebings professional oil dye, and after that impregnated using heat with Sno Seal, which mainly consists of beeswax (what is good for leather mountaineering boots should be good for a knifesheath!!) so it doesn’t soften the leather or let it get sloppy. 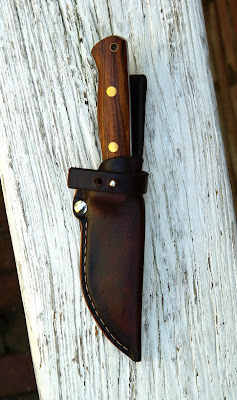 I let the leather soak up the melted wax until it’s saturated. It gives a mat shiny surface after rubbing and brushing of the excess after drying up. 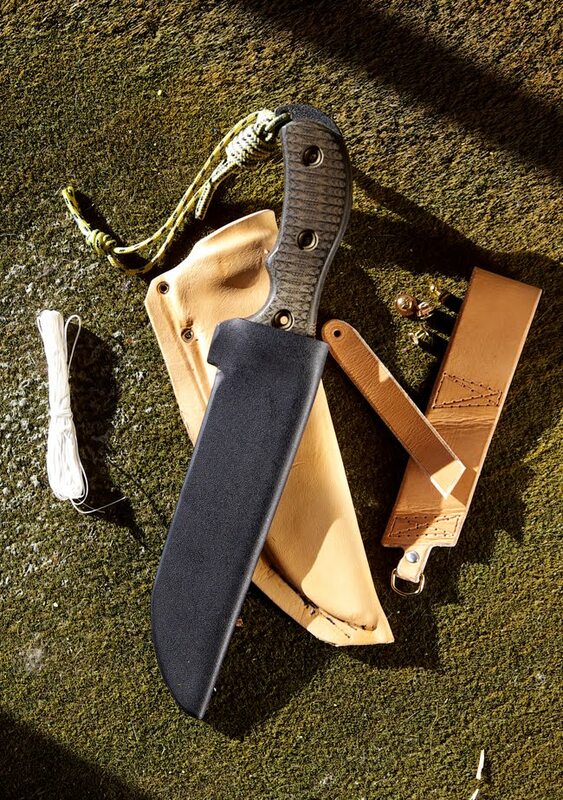 The wax on the inside won’t see any abrasion at all during use, and will permanent waterproof the sheath between leather and kydex. 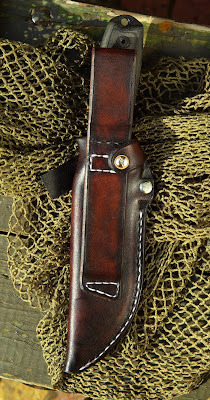 Rinsing it down under water won’t be a problem! 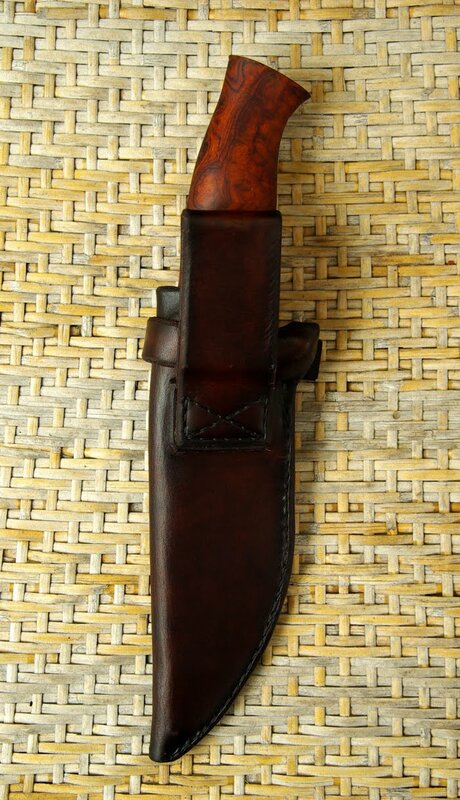 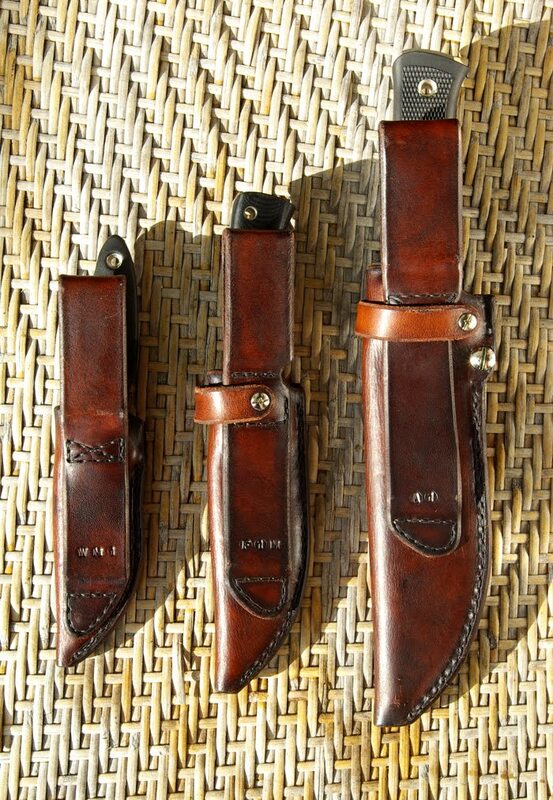 I'm using halftanned leather on most of my sheaths. 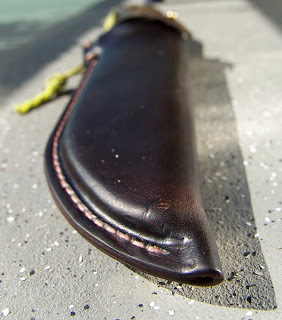 Halftanned looks and feels the same as vegetable tanned leather, but it has a core of rawhide. This makes it very strong and very hard to cut or puncture. 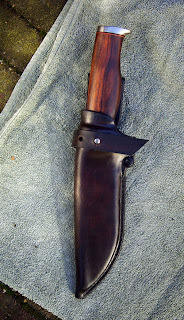 It also keeps it's shape better, and once wetformed, dyed and waxed, it's very resisitant to water. The holes for the stitches are all handpunched, and as small as possible. 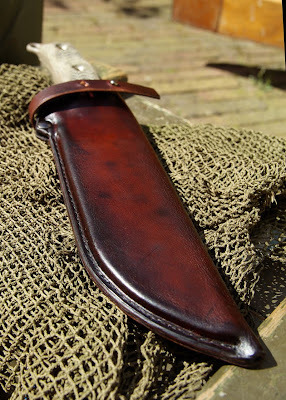 The sheath has rounded and polished edges all around. 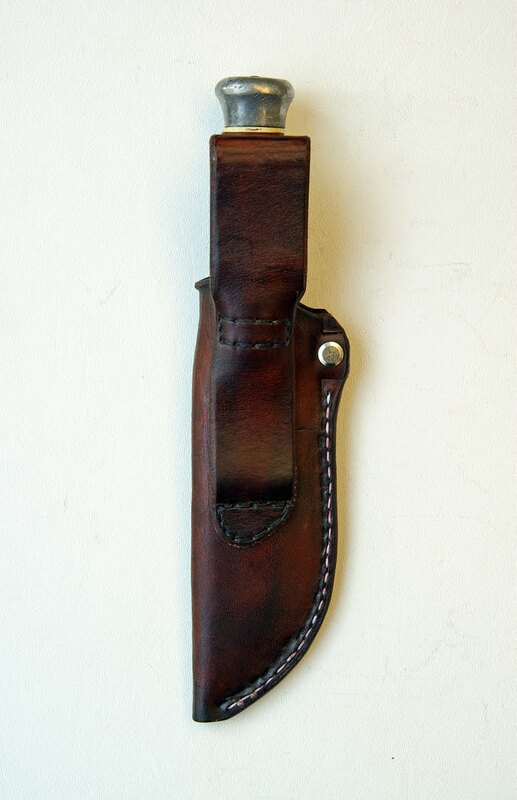 This will prevent moisture and dirt to enter the leather, and is easier to wipe clean. 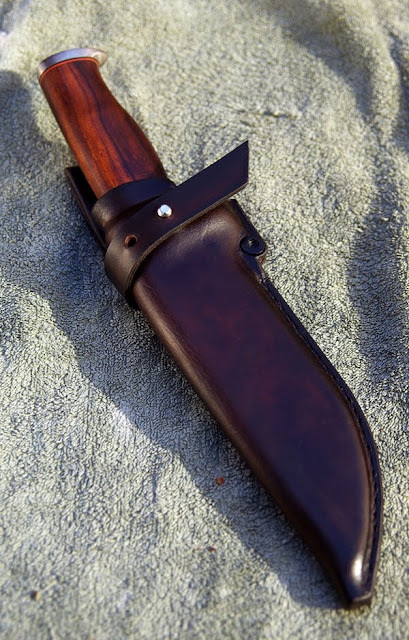 The edge is very hard, and even cutting in them on purpose will give you a tough job. 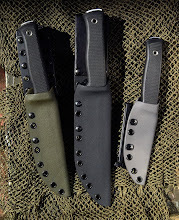 There are multiple carry-options possible. 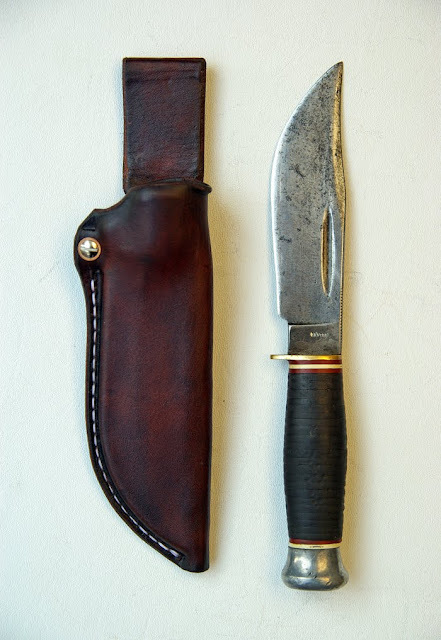 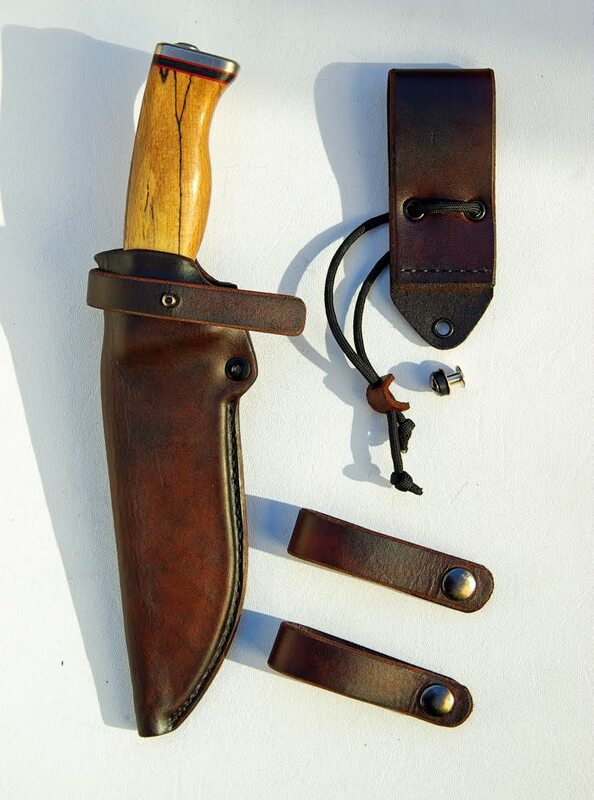 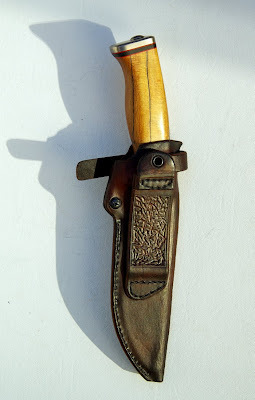 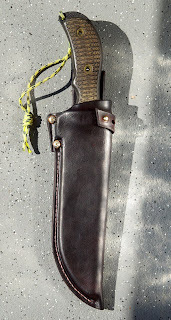 The sheath can be hung down as a dropleg on an optional dangler/beltpouch (yet to be constructed), it can ride plain low, and high on the hip, slightly canted forward. 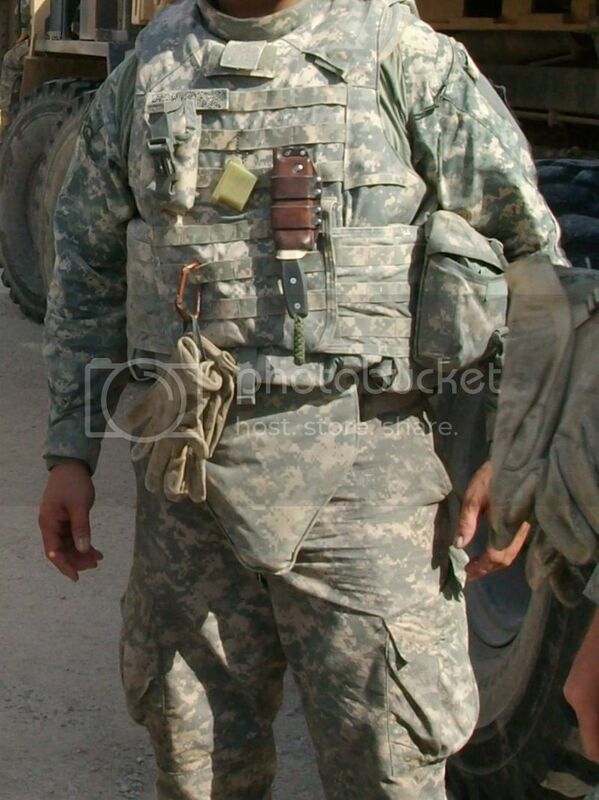 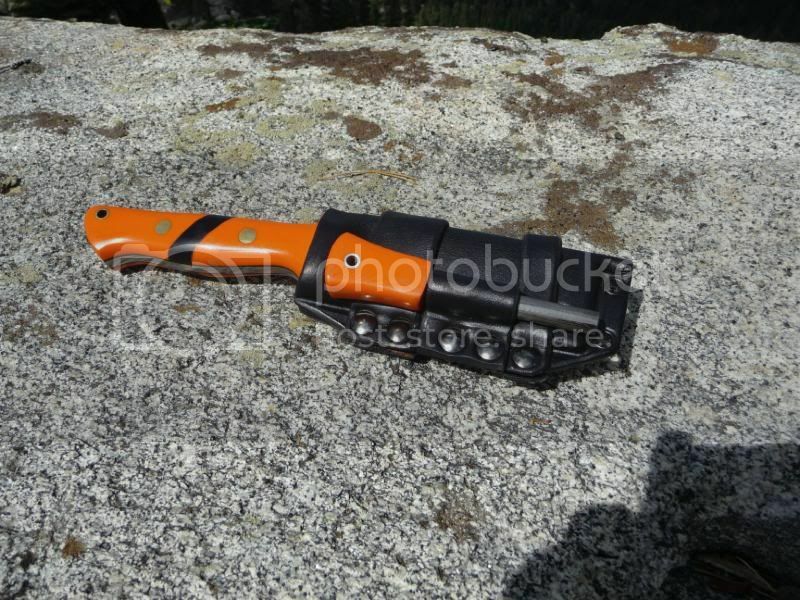 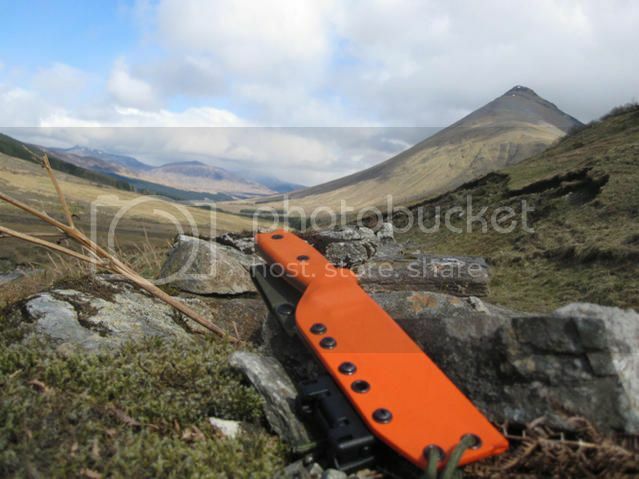 The sheath can easily be strapped to a backpack, or hang upside down on a chest-rig. 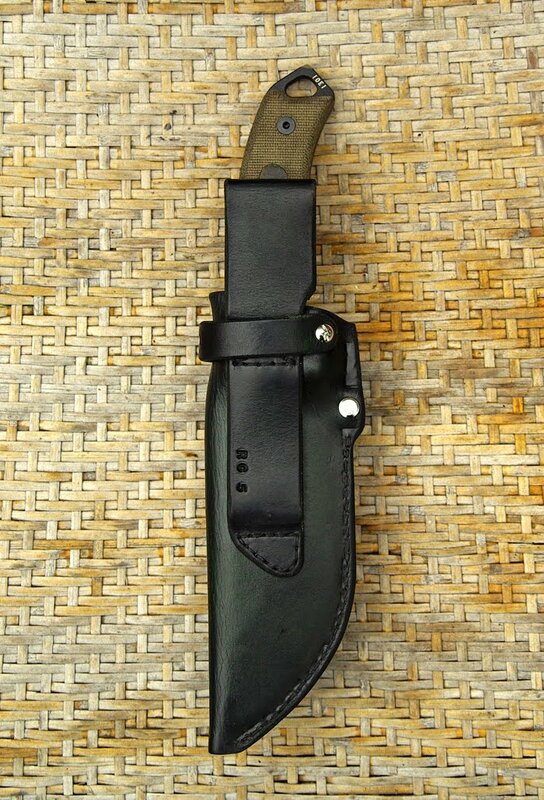 The knife won’t fall out hanging upside down. 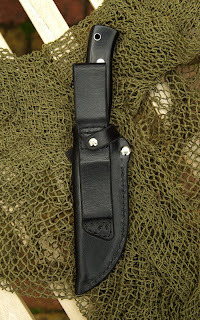 The amount of tension provided by the kydex is adjustable with a Chicago screw. 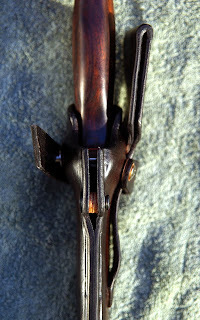 The screws are all fitted with bronze and leather washers so they are pretty to look at, and won’t work themselves loose. To be out of the way, the retention strap can be folded backwards and secured on the brass rifle button, or just hang loose vertically after opening up, so when sheathing and unsheathing the knife incidental cutting of the strap will be out of the question. The screw which attaches the strap to the sheath is secured with lok-tite, and bronze washers to provide a smooth operation which will not loosen the screw after a while. The ergonomics are very comfortable. 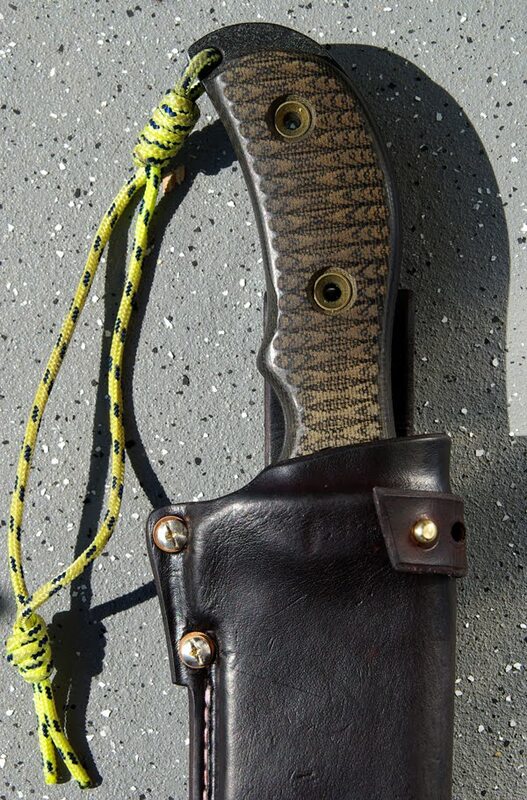 It’s easy to grab the handle of the knife full handed, and just draw it out.Or, when retention is tighter, grab the handle of the blade, and use the thumb to push the blade out in a controlled way. 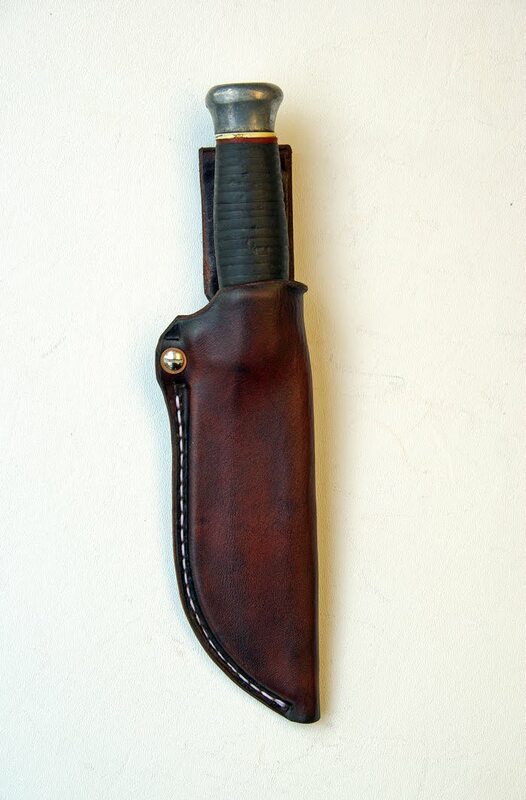 This type of sheath is not for the collector. Kydex WILL scratch the blade! 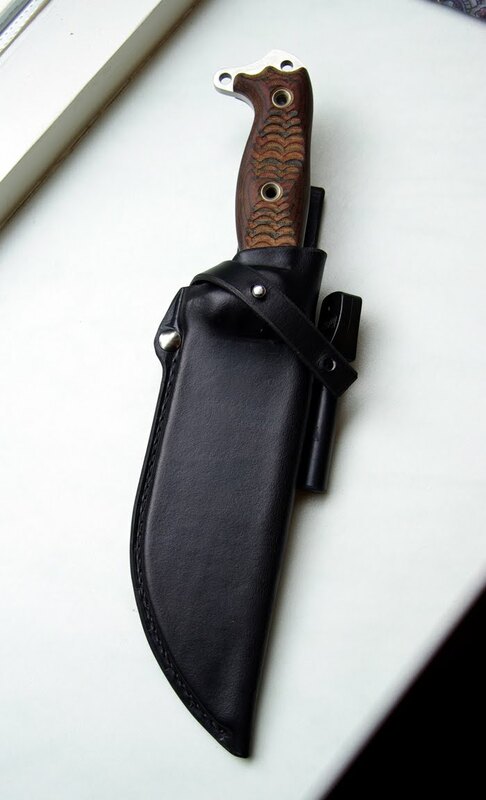 It’s meant for user knives where some scratches more or less won’t make a difference. 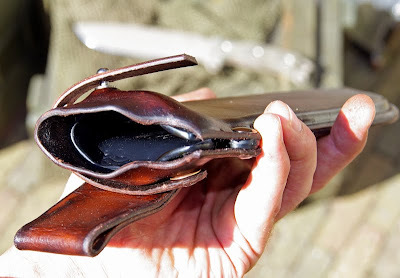 The ‘cup’ of the sheath. 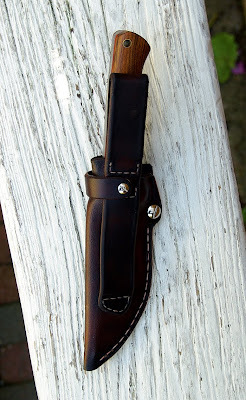 Leather spacer to prevent the edge of the blade making contact with the rivet. 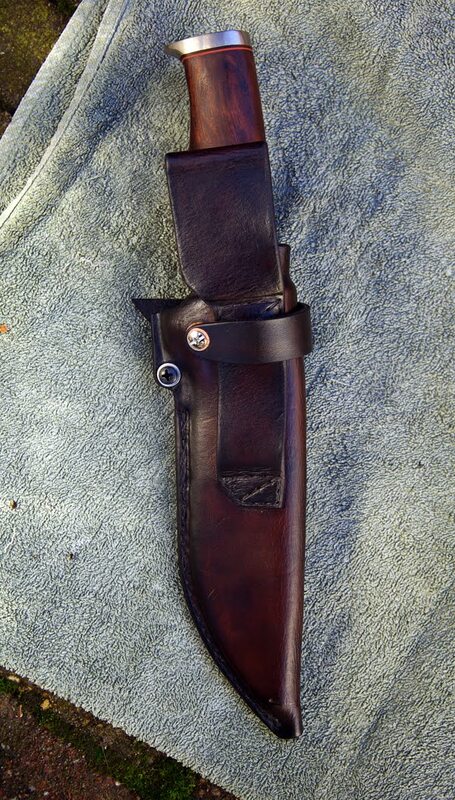 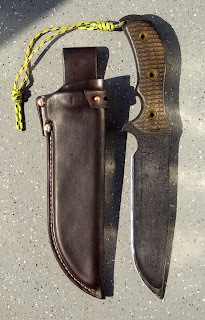 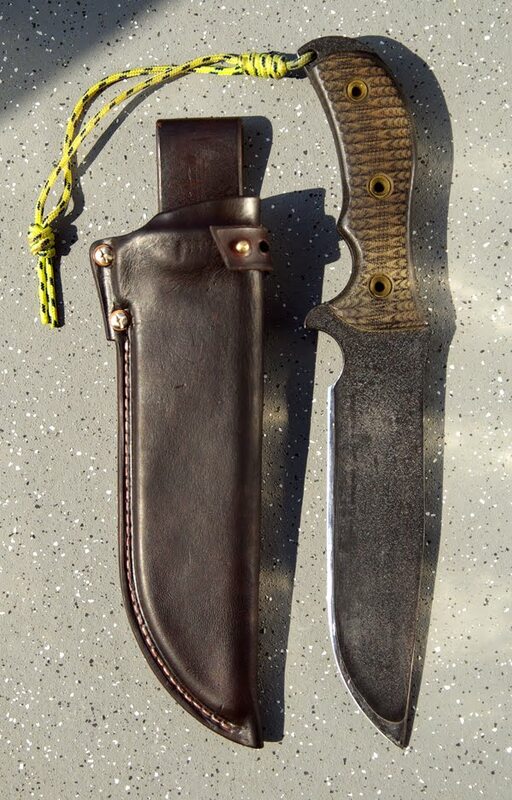 This was the very first sheath I build following this method and in the meantime a couple of details have changed. I do 1 retention screw only now as that is enough. 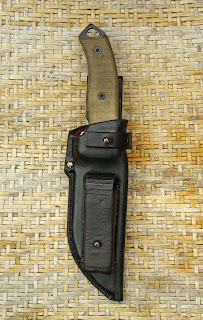 The retentionstrap is made out of halftanned and no longer out of lappleather. It matches better, and will, just like lappleather, have the snap for a very long time. 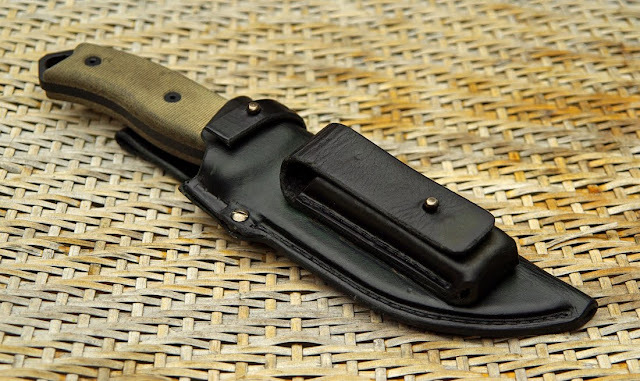 Lappleather is better suited for static use as when it dries out, it easily cracks deeply. 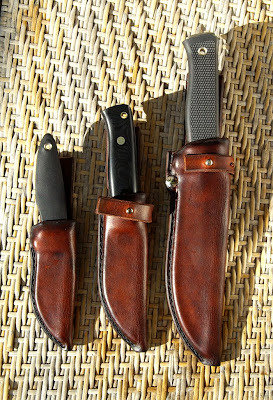 Here are some more recent sheaths I made. I still refer to them as the Ratweiler Pattern or the Martinsheaths Classic. If it didn't have the screw it would be a Bushcraft Pouch. 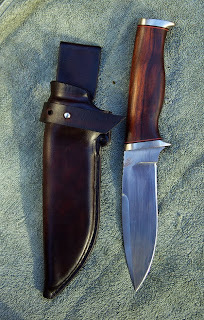 absolutely beautiful craftsmanship,and the thought that's gone into your work is amazing.Have a look at the artistry of Karen Shook(not sure if that's the right spelling);she does the sheaths for Daniel Winkler,custom knifemaker.I'd say the quality of your work is as good.Any plans in the future to make them 'prettier'?